For this post, CocoMamaStyle invites specialists in baby and kids PR, Fuse Communications to share with you ten of the best gift ideas for little ones. They’ve put together some fab picks if you’re struggling for chic and unique present inspiration and many are personal favourites here chez CocoMama. We’re big fans of stylish Spanish clothing brand Mayoral, beautiful Angel’s Face pettiskirts and cosy Aden and Anais muslins which all feature in this top ten. So whether you’re looking for prezzies for your own tots or last minute ideas for the little ones of friends and family here are ten which come highly recommended. 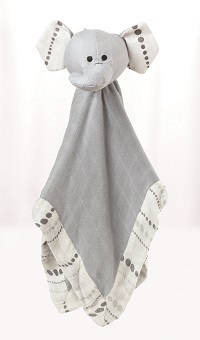 Also new for Christmas is aden + anais’ very first gift set which includes everything a new baby needs: 2 of aden + anais’ multi-functional 100% cotton muslin breathable blankets, a burpy bip which is a bib and a burp cloth, all in one, a Musy Mate and a Musy, a versatile muslin square which is an essential nursery item. The gift set comes in the Twinkle print which is perfect for Christmas and the brand’s popular Jungle Jam print and retails at £64.95. Angel’s Face is the Number 1 tutu pettiskirt brand and their voluminous skirts will make girls of all ages feel like a princess on Christmas Day! 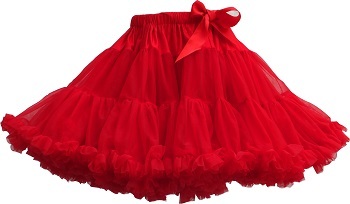 The skirts come in dozens of different colours, but we think the red tutu is simply perfect! What makes them even more fun to open is the fact that the skirt comes in a vintage style hat box, making it the perfect keepsake. Prices start from £35 and the skirts range from 0 – 1 years and go all the way up to adult sizes! Inch Blue’s adorable soft leather baby and toddler shoes are hand stitched in their very own workshop in Wales and are made using Chrome 6-free leather which is very safe for babies. 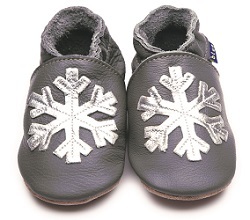 Our favourite festive design this season are the Metallic Snowflake shoes which come in ages 0 – 6 and retail from £18 – £20. Many people may not know this but Mayoral is consistently one of the best selling baby & kids brands in the UK. In Sept 2012, their first stand alone shop opened in the heart of Nappy Valley on Northcote Road in Clapham, London but people who can’t make it to the shop can buy online at Eric&Amy. We love their on trend tartan shorts and navy poncho and only wish they came in adult sizes! The shorts retail at £25.95 and the poncho retails at £47.95. Little Fashion Gallery is the original online kids concept store and features the very best clothing, toys and interiors for babies and kids. Little Fashion Gallery has collaborated with cult French label Heimstone who have created an adorable capsule collection in time for the festive season. 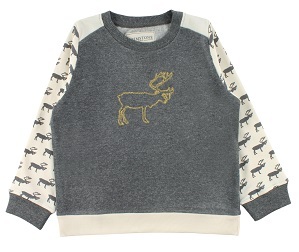 Our favourite design is the Claire sweatshirt which features a reindeer print for a chic take on the traditional Christmas jumper. It retails at £45 and comes in ages 2 – 10 years. Every girl needs the perfect party dress for the holiday season and our favourite is the Talia dress from Danish kids label, Mini A Ture’s Christmas collection. The dress comes in a deep plum colour and features gold metallic polka dots. All of Mini A Ture’s clothes are machine washable too so there’s no need for tears in the event of any mishaps! 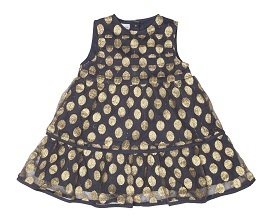 The dress is available at Igloo Kids and retails at £48 and comes in ages 2 – 7 years. Nothing beats a pair of UGG boots for keeping little toes warm during our cold snaps. Whilst all the new designs are fab, the classic low boot is always a practical and easy to wear option. 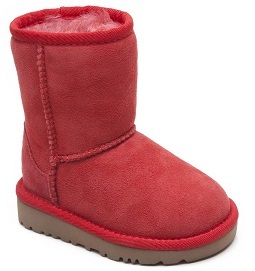 For a festive alternative, the boot also comes in red in addition to the more traditional brown, tan and black. They retail from £82 and come in sizes 22 – 39. Get them from www.step2wo.com, the UK’s only specialist kids shoe website. 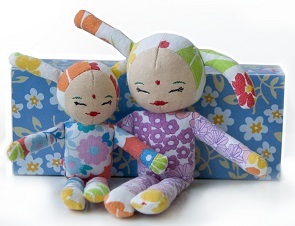 We love this special doll from Little Fashion Gallery! She’s simply very stylish and comes in her own flowery box. Each doll is unique, making them extra special. The Popje Cat doll comes in 15cm or 18cm and retails from £18 – £21. 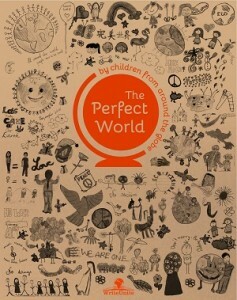 ‘The Perfect World’ is simply the perfect Christmas gift this year. It is the first book to be published by the charity WriteUnite, which has been set up by a very industrious 17 year old British student called Omara Elling-Hwang. The Perfect World is an enchanting book which features 700 submissions from school children from every continent who were invited to send in their written or visual interpretation of ‘the perfect world’ to Omara for inclusion in the book. Omara’s vision for the book was that we write to share our ideas with people from all walks of life and from all different backgrounds. The Perfect World retails at £19.99 and WriteUnite is supporting the Tegla Loroupe Peace Foundation in Kenya. Thanks to Fuse Communications for sharing your top gift ideas!